Remote post-production is one of these new workflows. Allowing people to get out of the edit suite and collaborate on video sequences from a laptop on their desk, in their living room or in a hotel in the middle of nowhere has had a massive impact on how we post-produce video and what kind of programmes we make and watch. But video people are a fickle bunch and we move quickly from being astounded by new tech to criticizing it. Working remotely on a laptop has drawbacks you need a desk or at least a flat surface to work effectively, battery power is limited and laptops are relatively cumbersome. The next logical step to providing a video editing solution suited to any environment may therefore be to follow the lead of so many other software providers and create a mobile app. ¢	Avids iPad app -Avid Studio - was aimed at the prosumer market and has been sold and incorporated into Pinnacle Studio. Avids Media Composer doesnt have a mobile app offering. 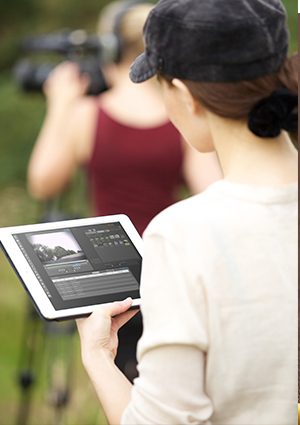 ¢	Final Cut Pro relies on supporting accessories and the acquisition of controlling apps to use the software on tablets. Apples iMovie app is not related to FCP and doesnt integrate with the professional tool. ¢	Adobe Premier Clip is an app that lets you edit content stored on your phone or tablet and share edits on social media - but you need to sync sequences to Adobe Creative Cloud to take them further in Premiere Pro CC. If none of editings big boys are doing it, does it mean that its not possible to provide full professional video editing functionality in a mobile app? If the only barrier was processing power then the iPad Pro - billed as a potential laptop replacement, on par with Apples entry-level MacBook computers would solve that problem nicely. But what about storing and accessing your media? While the 128GB capacity of the high-end iPad Pro is impressive, its unlikely that all the media you need to edit for a professional project is going to originate on your device. Another important factor is automatic updating the transition between working on one project across different devices needs to be seamless. Finally, as with any remote workflow, collaboration is key. Successful remote editing relies on being able to share work in progress with team members in different locations, if the only way to share your video is to publish it from your device then youre going backwards. Clearly this is not an easy task, but we think weve cracked it. 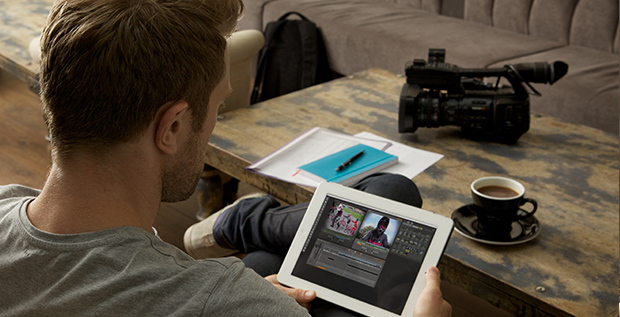 Forscene is the only truly cloud-based professional video editing software available, so we had a range of distinct advantages when we developed the Forscene app to run on iPad and Android tablets. Because Forscene users work on proxy versions of their media which doesnt demand huge bandwidth or processing power - we can provide full Forscene functionality on just about any computer or device. With all media and projects stored in the cloud, local space isnt an issue and the project is always up to date, no matter how you access it. And new users can be working on a project within seconds of being added to the Forscene account. There have been challenges. Accommodating smaller screen sizes while considering that buttons need to be big enough for fat fingers is tricky and were still working on a solution to make even more space available for on-screen keyboard display. Luckily these issues are resolved by the size of the iPad Pro screen, the Smart Keyboard and the Apple Pencil. Its a match made in heaven really. Of course, as tablets are completely touch screen driven, there are a couple of differences in how you control this video editing app: zoom buttons are replaced by a two fingered pinch and right click is replaced by press and hold. Apart from that, the tablet version of Forscene allows you to view and review, log, sync pull (stringouts for our US clients) and edit in exactly the same way as the desktop version. You can even export clips using the same publishing settings you have set up for your project. Recent Localytics research indicates that 57% of us are likely to use apps even more in the future, mostly because we believe apps will help us manage and connect all the digital elements in our lives. The Forscene app certainly meets those criteria, and editing broadcast video on a mobile app is a crazy enough idea that it may just turn the industry on its head.